Looks like early speed clears of the two ice magicites feature Armor Breakdown or Mental Breakdown as appropriate. I guess the enemies have big self DEF or RES buffs you want to clear to help keep your damage moving. If you’re using Locke as a Fire DPS, Steal Defense is also possivle. Particularly because Ninja abilities are overpowered already, his LD is doublecast ninja, and he can hit like...every element but holy because he's also got 6* machinist and 6* celerity too, I think? So I guess I really need to get to work on Phoenix/Belias. I've at least got gen1 fire and ice chains for the next ones. Hell, even his newest USB is just his USB0 with some damage tacked on as an afterthought. 1/3 Zack LMR. I've got his chain and ultra, so that is cool. Guess I’ll need to table Mateus until I can work out something proper or steal someone’s strategy. I have basically everything I’d need for physical Fire outside of an Arcane or Elarra, so it should be workable. But for now I think I’d rather grind Arcana to feed Phoenix, so I can try Manticore. That viii event has a strictly better ice banner if you can wait a month. Terra LMR. Sigh, this would have been ok if I had anything for her. Also 5th lmr in a row. This tortured existence. Mog U2 (Proshellga, Hastega, and Hyper Break). This is very much not tuned for most Magicites, but I'm sure there are other fights where I can use this thing properly. Every Break Mog should be kinda neat in other fights, with his RLM (Chance to do more breaks on dance) and LM2 (Chance to Medica on dance), I think? And I guess 5-stars have less status change resistance than 4-stars, so maybe this could work there? Shadow LMR dupe. Short of miraculous draws in the last five, this is the worst RoP for me. And they took out the SSBs and it's still tragic, what the heck? They didn’t stop making bad relics when ssb was done. Just barely managed to kill Belias with one last W-cast. Literally. Reran the fight, ended up in the exact same situation, didn't W-cast, and died 2 seconds later. Still, it was a 31.5s kill, so just a scootch more power from somewhere and I think I can get sub30, or a consistent kill (probably not both at the same time though). I think it's possible to force Phase 3 before phase 2's Saber into Hellfire, in which case I can probably survive a bit further into phase 3 and get an assured kill. But I can't assuredly push phase 3 that fast, so it's more oh well. Major Fire resist on Eiko, Moderate on everyone else. +Water armor on everyone. Tidus is whatever. Eiko puts up Protect then spams Mage's Hymn into her USB, then spams Hymn and reapplies her USB whenever Guts pops. Tidus goes Chain, Bullet, wait til ~9s, cast Power Break to land after Saber, Bullet, Defend, refresh Chain (after Painflare), Power Break ASAP, Bullet spam until end. The end is tricky. Basically have to force phase 3, use Tidus's Fastcast to speed out all the caster's USB refreshes, then they use OK's Fastcast to kill the boss faster than he can kill us. I'm making progress on Belias, but having trouble dealing with the berserk. Bleh. For the most part, force Phase 3 before Berserk in Phase 2 seems to be the go to strat. Otherwise you might want to double heal it with the second healer being Larsa. So this FF9 event is the first event I haven't been able to get a MP group AT ALL for the lower difficulty. I guess this game really is dying? Why would anyone bother doing mp for 160. VI: 1/3, no disco. Shadow LMR, which is one of the good ones, though I have nothing else for him. Granted, he's still a ninja, so spamming the dark washing machine works just fine. 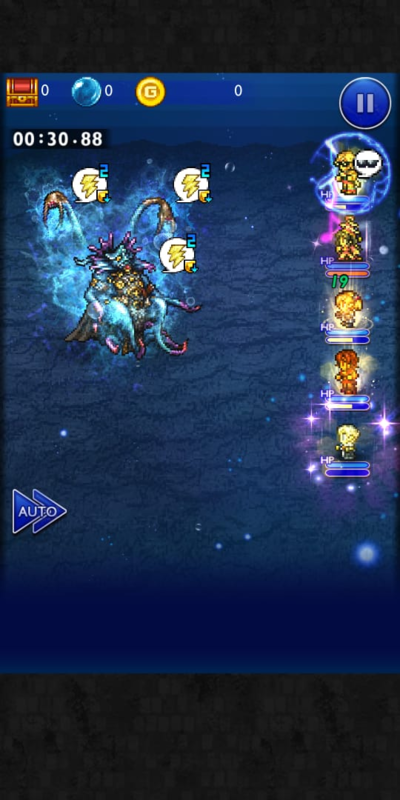 I've never thought ffrk mp was any kind of fun. The fights are easier than the regular fights of the event when playing solo too so i've never looked back. Got Celes glint today, more Celes relics is always good! Because the stupid Book of Trials to open the Torment dungeons says you need to clear a raid of at least 160 or higher and unless there's a group willing to carry someone through the higher difficulty, well... and I'm certain that more Record Dungeons will end up locked behind it, too, in a few months. Realms on Parade coughed up a 1/3, 1 disco result: Kefka USB! Just one word made me sit up and take notice- "poison". I don't think there's a lot of poison SBs out there, and it's one of the harder elements (outside of the Bio spell line) to get a strong, reliable source of damage for (at least for me). Ten magical dark/poison/nonelemental attacks, a medium magic buff, and then the ability to follow up attacks with even more dark/poison/nonelemental damage? Yes, please. yup Shadow LMR and no SBs for him. Oh boy. At least Xander counters dispel with mighty guard. I keep getting dupes on daily also, they just aren’t five star heh. Got Faris’s Sea Lord Broadside (Unique which does Nonelemental damage and ATK/MAG breakdown). Which Ain’t a dupe, but it’s competing with her B1 and B2 for Faris-style breakage. The anination’s fun, though. Whelp. The game took pity on me for giving me a Chain I already had, by giving me ANOTHER different Chain on the Daily Draw. Laguna's Bazooka, Gen 2 PHY Ice Chain. That's timely given Syldra came out yesterday! Poor Snow, your time of relevance ended before you even got a shot at the big time. I am still salty AF about my 100 gem streak lately, but this certainly helps soothe the burn. Interesting thing I've gleaned from looking at JP screenshots: apparently 3* and 4* relic draws also award the lowest grade of Anima Lens. So enough 1/11 draws (or enough misses on the daily draw) and you can trade in for a unique/SSB. I hate you just the most tiny bit. Honestly you could probably clear everything in game with the dupes people draw in here. Hrm. Now that the VI event is here, and after having attempted Mateus and finished my dealings with Belias, I’m almost thinking that banner 1 looks more inviting then banner 2, with Strago’s chain and Wind God Gau. The Glint and LM2 for Relm look real nice, Locke’s Arcane is something I ain’t got, and Edgar’s tools would be really good for Mateus, if one needs as much Imperil as I’ve been hearing. On the other hand, I really should look up some Mateus clears and make a good-faith effort to do it with what I’ve got. Sadly, it’s pretty much certain that I’ll have to pick one banner or the other, owing to my inability to stay away from stuff like Realms on Parade. Speaking of which, FFV draw. Lenna B2 dupe. Lovely. I’m sure this Barice will come in handy for Mateus, hah. Funny thing, the dupe actually didn’t show me initially that Lenna had mastered the soul break. I thought that somehow I forgot to do that.